a Demo Against Winter will snake it’s way through the small streets of Prenzlauer Berg and part of Mitte. The meeting point for HEAT is ACUD MACHT NEU, Veteranenstr. 21, Berlin-Prenzlauer Berg at 14:00 Uhr. HEAT is a Demo against Winter ironically protesting the dark Winter period while simultaneously igniting community as we collectively fight for Summer. 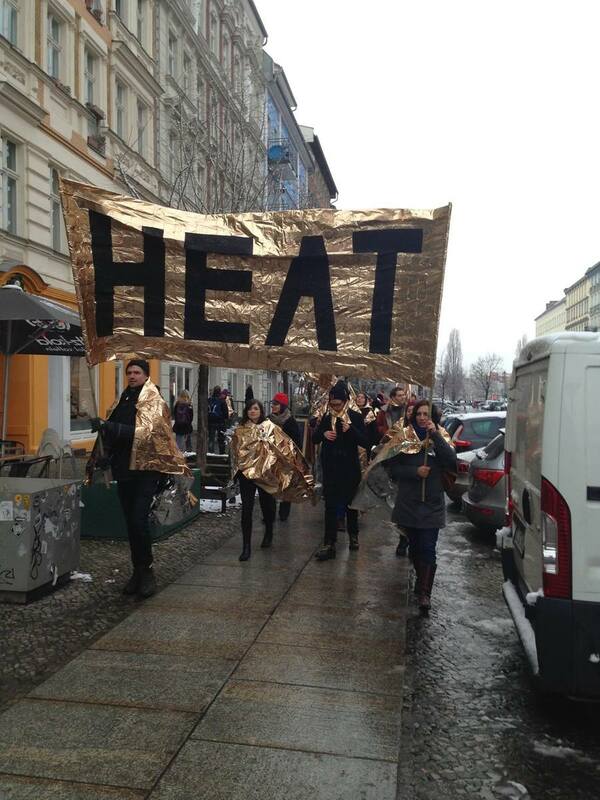 HEAT’s unifying visual theme is the Space Blanket or Rettungsdecke which will have the function of keeping the Demonstrators warm but also acting as a visual unifying element of the Demo. The Space Blanket first developed by NASA in 1964, is light weight and reduces heat loss in a person's body. The Space Blankets can be used by the Demonstrators for banners, flags, and body wraps of all kinds. HEAT’s route leaves ACUD Macht Neu at 14.30 with the percussion band Kiboko and goes left on Veteranenstr., left on Fehrbelliner Str., Right on Anklamer Str., Left on Wolliner Str., Right on Rheinberger Str., Left on Schwedter Str., Right on Oderberger Str., Right on Choriner Str., Left on Schwedter Str. - Right on Christinenstr., Right on Zehdenicker Str. and straight through Volkspark am Weinbergsweg back to ACUD Macht Neu for an afterparty that includes music by Kiboko - an Afro-Brazilian Percussion band, homemade soup, and warm drinks. HEAT has been initiated by April Gertler (US) and Asmund Hasten-Mikkelsen (DK) - both international artists living and working in Berlin for the last 10 and 7 years respectively.